Design of the Bo.105 lightweight, general purpose helicopter was begun in July 1962 utilising basic experience gained by the company in the preceding few years in building the Bo.102 and Bo.103. The former was a non-flying, ultra-light helicopter trainer, and the Bo.103, flown for the first time on 9 September 1961, was essentially the same aircraft minus its fixed base. An enlarged version of the Bo.103 was proposed as the Bo.104, but this project was supplanted by the more promising Bo.105. Under German government contract, ground rig testing of its radical rigid rotor and construction of the first prototypes began in 1964. The first prototype airframe (V-1) was ready for ground testing September 1969, powered by two Allison 250-C18 turboshaft engines and using the hinged-rotor from a Westland Scout, was destroyed on the ground at an early date by resonance problems. The second prototype, first flown on 16 February 1967 at Ottobrunn (Munich), was the first to take to the air with hingeless titanium rotor hub and composite rotor blades. Powered by twin Allison 250-C18 turboshaft engines, the non-articulated rotor, whose fold-able blades are reinforced with glassfibre, has been developed over several years by Bolkow in association with Sud-Aviation and has been adopted by the French company for its own SA.341 light helicopter. Further changes and modifications led to the third prototype — the V-3 fitted with two German-built MAN-Turbo 6022 turbines (first flown on 20 December 1967), and to two pre-production models, the Bo.105 V-4 and V-5, the first of which made its maiden flight on 1 May 1969. Two Allison 250-C20 turbines were later installed on the V-4, which thus became the prototype of the definitive Bo.105C. Meanwhile, from spring 1970, new "droop snoot" design blades, which had a marked downward curvature on the leading edge, were introduced. These were made by MBB, the Messerschmitt-Bolkow-Blohm und Voss group — of which Bolkow and its affiliates had become part. In 1972, the Bo.105 went into full-scale production at the company's Donauwörth facility in Germany, and was offered with either Allison 250-C18 turbine engines or the more powerful C20. The helicopter was approved by the German Federal Authority LBA with the first power-plant in October 1970, after successfully completing autorotation trials in the autumn of 1969. Approval by the US Federal Aviation Administration followed in March 1971 and was extended to the C20 engines in August 1972, while the Canadian authorities certified the Bo.105 in April 1973. 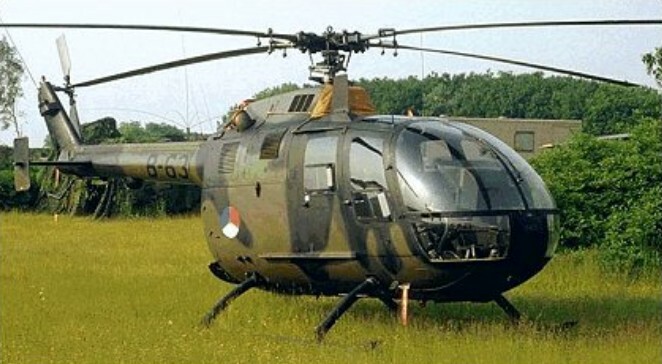 The German helicopter also received a British Certificate of Airworthiness in July 1973 and was recognized by the Italian Aeronautical Register in March 1974. The German government ordered 20 for its "Katastrophenschutz" programme, to ensure rapid assistance in the event of a disaster. The military version differs little from the civil one. The antitank version can carry six HOT missiles, three on either side of the cabin, with a stabilized sight on the port side. The Federal German government authorised production of a total of 439 BO 105s for service with the German army. 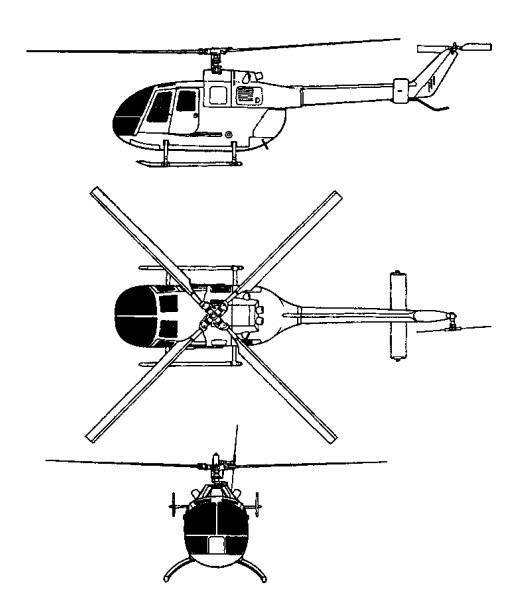 These comprised 227 of the BO 105 M(VBH), a liaison and light observation version of which deliveries began in 1980; and 212 of the BO 105 P(PAH-1) anti-tank version, each able to carry six Euromissile HOT missiles. Initial deliveries of this latter version, to Heeresfliegerregiment 16, began in December 1980. MBB has also developed an anti-tank version able to deploy eight Hughes TOW missiles. Other military operators include the Mexican navy with six radar-equipped versions used for maritime patrol, and the Spanish army with 60 BO 105Ps, 57 of them assembled by CASA. The Spanish company is also assembling 80 105s for other customers, and there are active licence-assembly programmes underway in Indonesia as the Nurtanio NBO 105, and Chile. BO 105 LS helicopters produced at Eurocopter's Fort Erie facility in Ontario, Canada. Others are in use in Brunei, Canada, Ciskei, Colombia, Holland, Iraq, Nigeria, Peru, Sierra Leone and Sweden. Sweden operates an unarmed SAR version known as the HR 9B. By 1991 more than 1,300 BO 105s had been delivered to 37 countries. The civil version has also been a major export success and was initially marketed through Boeing in the United States before MBB set up its own US facilities. The BO 105C was superseded in 1975 by the BO 105 CB which became the standard production version. By the end of 1981, total production of the Bo.105 exceeded 1100. More than 100 Bo.105s were in operation in the United States and these were joined in 1982 by the Bo.105CBS Twin Jet II variant, with 420shp Allison 250-C20B turbines, which, apart from having better flying capabilities, has 20 per cent more cabin room. The BO.105CB-3 variant of the standard production CB and CBS versions has a longer fuselage. The Messerschmitt-Bolkow-Blohm GmbH Bölkow Bo.105 DBS-4 version has the 10-inch fuselage stretch at the rear of the cabin and the extra small rear side windows. Further development of the Bo.105CBS led to the introduction in 1981 of the Bo.105LS (Lift Stretch) which combines the enlarged cabin with the uprated transmission of the military version and more powerful 550shp Allison 250-C28C engines to provide a much improved hot/high performance and external lift capability. Bo.105 LSA3 is a stretched cabin version. Featuring two Allison C28B engines, each with a separate drive to the main transmission, separate fuel and lubrication systems and dual hydraulic boost system. Providing the lift and directional control is a hingeless four-bladed main rotor and a semi-rigid two-blade tail rotor, all of fibre reinforced composite material. The rear-loading clamshell cargo compartment is rigged to allow accommodation of bulky cargos or stretchers by removing the rear bulkhead behind the passenger compartment. Sales total more than 1300 to 37 countries by 1990. Navalised BO.105s are fitted with Sperry Primus 500 search radars and other maritime equipment, and have folding main rotor blades for shipboard stowage. An BO 105 fitted with a rear fuselage fairing, rotor head fairing and four small individual landing gear skids, was developed under a high-speed research programme. Known as the BO 105HGH, this aircraft attained a speed of 372km/h in a shallow dive at max AUW in September 1973. Flight testing was continued in 1974 after the addition of 6.00m fixed wings with an NACA 230 section varying from 15% thickness/chord ratio at the roots to 12% at the tips. Airbrakes are mounted above and below the leading-edge of each wing, and a shorter-legged landing gear is fitted. The HGH programme (Hochgeschwindigkeits Hubschrauber / High Speed Helicopter) ended on 4 March 1975 with a flight in which the aircraft attained a max speed of 404km/h; max blade tip speed was Mach 0.97. The BO 105HGH, which was converted from a pre-production BO 105 airframe, was to continue in use as a rotor blade testbed. DESIGN FEATURES: Four-blade main rotor, comprising rigid titanium head and GFRP blades, with titanium anti-erosion strip and pendulous vibration damper on each blade. NACA 23012 lifting aerofoil with drooped leading-edge and reflexed trailing-edge. Two-blade semi-rigid tail rotor. Tail rotor gearbox on fin. Main rotor 424 rpm. Tail rotor 2,220 rpm. Main transmission utilises two bevel gear input stages with freewheeling clutches and a spur collector gear stage. Planetary reduction gear; three auxiliary drives for accessories. Main transmission rated for twin-engine input of 257kW per engine, or a single-engine input of 283kW. Uprated transmission and Allison 250-C28 engines in BO 105 LS for exceptional hot-and-high performance. EC Super Five has new main rotor blades and performance improvements, including 150kg more rotor lift; better stability; and airframe vibration reduced to less than 0.1g. FLYING CONTROLS: Main rotor has roller bearings for pitch change. Main rotor brake standard. Dual controls standard on EC Super Five. STRUCTURE: Folding of two main rotor blades optional. Tail rotor blades of GFRP, with stainless steel anti-erosion strip. The fuselage is a conventional light-alloy semi-monocoque structure of pod and boom type. Glass fibre reinforced cowling over power plant. Titanium sheet engine deck. Horizontal stabiliser of conventional light-alloy construction with small endplate fins. LANDING GEAR: Skid type, with cross-tubes designed for energy absorption by plastic deformation in the event of a heavy landing. Inflatable emergency floats can be attached to skids. POWER PLANT: BO 105 CBS: Two 313kW Allison 250-C20B turboshafts, each with a maximum continuous rating of 298kW. Bladder fuel tanks under cabin floor, capacity 580 litres, of which 570 litres are usable. Fuelling point on port side of cabin. Auxiliary tanks in freight compartment available optionally. Oil capacity: engine 12 litres, gearbox 11.6 litres. EC Super Five additionally has scavenge oil filter and one-handed engine starting arrangement. BO 105 LS A-3: Two Allison 250-C2BC turboshafts, each rated at 410kW for 2.5 minutes, and with 5 minute T-O and maximum continuous power ratings of 373kW and 368kW respectively. Main transmission, type ZF-FS 112, rated for independent restricted input of 310kW per engine at T-O power or 294kW per engine for maximum continuous operation; or single-engine restricted input of 368kW at maximum continuous power, or 410kW for 2.5 minutes at T-O power. Fuel capacity as for CB/CBS. Oil capacity 4.5 litres per engine. ACCOMMODATION: Pilot and co-pilot or passenger on individual longitudinally adjustable front seats with safety belts and automatic locking shoulder harnesses. Optional dual controls. Bench seat at rear for three or four persons, removable for cargo and stretcher carrying. A full EMS version is available. Both cabin and cargo compartment have panelling, sound insulation and floor covering. Entire rear fuselage aft of seats and under power plant available as freight and baggage space, with access through two clamshell doors at rear. Two standard stretchers can be accommodated side by side in ambulance role. One forward-opening hinged and jettisonable door and one sliding door on each side of cabin. Ram air and electrical ventilation system. Heating system optional. SYSTEMS: Tandem fully redundant hydraulic system, pressure 103.5 bars, for powered main rotor controls. System flow rate 6.2 litres/min. Bootstrap/oil reservoir, pressurised at 1.7 bars. Electrical system powered by two 150A 28V DC starter/generators and a 24V 25Ah Ni/Cd battery; external power socket; stability augmentation system standard on BO 105 LS A-3, with hoist, firefighting kit, weapons fittings, mast-mounted sight and floats optional; EC Super Five has improved hydraulic system. BO 105C: Initial production version offered with either 236kW Allison 250-C18 or 298kW 250-C20 turboshaft engines. BO 105 CB: Standard production version from 1975, with two Allison 250-C20B engines, operable in air temperatures ranging from -45 to +54°C. LBA certification received in November 1976. BO 105 CBS-5: Military army/naval version for armed and non-armed missions; can be equipped with anti-tank missiles, rocket launchers. Gun pod or turret. First 12 ordered by the Republic of Korea Army; most assembled from kits by Daewoo. Include Boeing IR/optical sights and defensive aids suite. BO 105 CBS-4 / Twin Jet II: Version with increased rear seat leg room in a cabin extended by a 0.25m plug. Available in five-seat executive or six-seat high-density configurations. Identified by small additional window aft of rear door on each side. Marketed in the USA by MBB Helicopter Corporation under the name Twin Jet II. First CBS version certified in early 1983 by FAA for IFR operation in accordance with SFAR Pt 29-4, requiring two pilots, radar, Loran C and a separate battery, but not a stability augmentation system, although SAS was an option. BO 105 LS: Canadian-built version of BO 105 CBS with increased power for 'hot-and-high' operation. Combining the larger cabin of the BO 105 CBS with two Allison 250-C28C turboshafts each with a maximum take-off rating of 373kW. First flight 23 October 1981, German LBA certification July 1984, followed by FAA and Canadian DOT type approval. In Spain, CASA assembled 57 of an initial 60 for the Spanish Army. BO 105 LSA-3: Hot-and-high version, certified 7 July 1986 and first delivered February 1987. Uprated transmission and Allison 250-C28 turboshaft engines, rated at 410kW for 30 seconds. Built solely by Eurocopter Canada at its Fort Erie, Ontario plant. BO 105 LSA-3 Super Lifter: Optimised for external load and heavylift missions; max T-O weight 2,850kg; upgraded tail rotor derived from BK 117C-1. Type certification granted October 1995. Built solely by Eurocopter Canada. BO 105 LS B-1: One-off testbed C-FMCL, powered by two 307kW Pratt & Whitney Canada PW 205B turboshafts, made first flight 13 October 1988. BO 105 M (VBH): Liaison and light observation helicopter for the Federal German Army, with strengthened transmission gearing, reinforced rotor components, a tail rotor with improved thrust and performance, a rupture-proof fuel system and a landing gear able to absorb higher energy levels. Production of 100 approved by the Federal government, to replace Alouette II. Deliveries completed in 1984. BO 105 P (PAH-1): Anti-tank version of the BO 105 M, with same airframe improvements as BO 105 M, outriggers to carry six Euromissile HOT missiles, a stabilised sight above the co-pilot and a Singer AN/ASN-128 Doppler navigation system. The Federal German government gave its approval for the procurement of 212 PAH-1s for the Federal German Army. Deliveries began on 4 December 1980 and were completed in mid-1984. EC Super Five: High-performance version of BO 105 CBS-4, derived from German Army PAH-1 upgrade programme; certified late 1993. New main rotor blades, improved performance and reduced vibration; dual flying controls as standard. KWS-1 upgrade programme implemented in late 1980s, including installation of a digital weapon system, reduction in launcher weight, improved cooling unit, newly developed main rotor blades, and an increase in MTOW to 2,500kg. Engine: Allison 250-C20, 400 shp maximum, 385 shp continuous. Rotor: four-blade, semi-rigid, glass-fiber and reinforced plastic. Height: 9 ft. 7 in. Main rotor diameter: 32 ft.
Seats: 5. Empty weight: 2,698 lbs. Payload with full fuel: 1,339 lbs. Fuel capacity (std. ): 153 USG/1,033 lbs. Fuel capacity (opt,): 258 USG/1,742 lbs. Baggage area: 57.5 cu. ft. Maximum sling load: 1,984 lbs. Rate of climb: 1,250 fpm. Single-engine service ceiling: 4,200 ft. Maximum speed: 167 mph/145 knots. Econ cruise: 124 mph/108 knots. Range @ max cruise (45-min res., std. tanks): 385sm/335nm. Range @ econ cruise (45-min res., std. tanks): 350sm/304nm. Duration @ max cruise (no res., std. tanks): 3.5 hrs. HIGE: 7,900 ft. HOGE: 5,850 ft. Single-engine HIGE: 2,200 ft.
Fuel cap (+aux): 580 lt (400 lt ). Engine: 2 x Allison 250-C20B, 420 shp. Max ramp weight: 5291 lbs. Max takeoff weight: 5291 lbs. Standard empty weight: 2780 lbs. Max useful load: 2511 lbs. Max landing weight: 5291 lbs. Max sling load: 1984 lbs. Max usable fuel: 1008 lbs. Max rate of climb: 1476 fpm. Hover in ground effect: 8,400 ft. Hover out of ground effect: 5300 ft.
Normal cruise @ 3000 ft: 126 kts. Fuel flow @ normal cruise: 355 pph. Endurance @ normal cruise: 2.6 hr. Engine: 2 x Allison 250-C20. Engines: 2 x Allison 250-C28C, 500 shp. Main rotor dia: 32.4 ft.
Std empty wt: 3153 lbs. Max useful load: 2579 lbs. Max ldg wt: 5732 lbs. Std usable fuel: 150 USG/1005 lbs. Optional usable fuel: 106 USG/706 lbs. Fuel flow at cruise: 335 pph. Endurance at cruise: 3 hr.